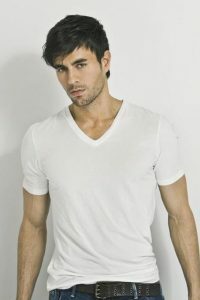 ENRIQUE IGLESIAS RETURNS TO CAESARS PALACE: Latin music phenomenon Enrique Iglesias will return to The Colosseum at Caesars Palace for his third consecutive year celebrating Mexican Independence Day weekend on Friday and Saturday, Sept. 15 and 16 at 8 p.m. Iglesias has sold more than 100 million albums worldwide and released 10 studio albums and two greatest hits compilations. He has headlined 11 world tours throughout his career. This June, he will embark on a new North American tour with fellow Latin superstar Pitbull. 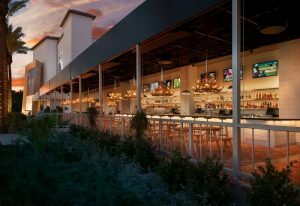 PROOF TAVERN WILL OPEN AT LAKE LAS VEGAS’ MONTELAGO VILLAGE: Upscale Proof Tavern, a new gaming and dining establishment, will open in the MonteLago Village in early April serving American comfort foods and classic favorites with a modern twist for breakfast, lunch and dinner. Hours will be 8 a.m. to midnight Sunday – Thursday and 8 a.m. to 2 a.m. Friday – Saturday. Happy hour specials will be Monday through Friday from 4 to 7 p.m.
PALACE STATION SWITCHES GEARS: Palace Station has been identified with its train-themed artwork that has adorned the resort’s facade for the past 34 years. As the casino undergoes a multi-million dollar, two-stage renovation, the theme is being dismantled. The first stage being completed by late spring is the new “mid-century modern meets contemporary” façade and a new 362-seat bingo room. The current 307-seat bingo room will be turned into new restaurants in stage two. Originally Palace Station was called The Casino when it was built in 1976 and then Bingo Place when a bingo room was added. When the property was enlarged with a full range of amenities, a contest determined the name and train theme that took over in 1983. THE NERD IS NEW NIGHTCLUB AND BOWLING VENUE AT NEONOPOLIS: The Nerd is for sure an unusual name for a nightclub. The new nightlife concept, which opened last week at the Neonopolis complex Downtown, includes a bowling venue and occupies the space vacated by the former Drink & Drag nightclub. The space includes a 12-lane bowling alley and dance floor. The Nerd has been created by Jonathan Borchetta, owner of the Voodoo Zip Line attraction at Rio. TYSON BECKFORD HAS ‘CHIPPENDALES’ RESIDENCY: With the Magic Mike franchise opening at the Hard Rock, the Chippendales at the Rio are offering competition with Tyson Beckford bumping and grinding for more than three months or maybe longer. 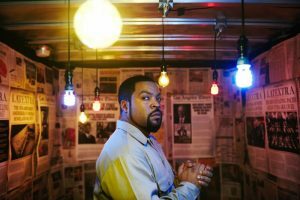 He broke records two years ago when he made a three-week guest appearance in the show. This time around instead of just joining the strip tease ensemble, he’s appearing in more numbers and several custom-choreographed dances. 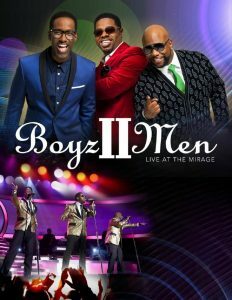 BOYZ II MEN RELEASE THEIR REMAINING 2017 DATES AT THE MIRAGE: Multiple Grammy® Award-winning R&B vocal group Boyz II Men have set their show dates through 2017 at The Mirage. The trio featuring baritone Nathan Morris alongside tenors Wanya Morris and Shawn Stockman perform in the Terry Fator Theatre on select weekend dates. Confirmed dates are: Aug. 18–20, 25–27; Sept. 1–3, 15–17; Oct. 6–8, 13–15, 20–22, 27–29; Nov. 10–12, 17–19, 23–25; and Dec. 22–24. Tickets start at $49.99. Boyz II Men will resume their Las Vegas-residency at The Mirage after embarking on “The Total Package Tour” this summer with New Kids On The Block and Paula Abdul. “The Total Package Tour” will stop at T-Mobile Arena on May 28. RODNEY ATKINS HEADLINES ‘BACK THE BADGE’ BENEFIT CONCERT: Country superstar Rodney Atkins will headline “Back The Badge,” a benefit concert supporting southern Nevada’s local law enforcement, at the Orleans Arena Thursday, April 20 at 7:30 p.m. Proceeds will assist the Injured Police Officers Fund (IPOF) and the Southern Nevada Concerns of Police Survivors (SNVCOPS). Tickets start at $25. Atkins, who has released four albums, is best known for his No. 1 country hits “Take A Back Road,” “It’s America,” “These Are My People” and “Watching You.” In 2006, he won an Academy of Country Music (ACM) award for Top New Male Vocalist. BEER NEWS: More than 100 craft breweries are now on tap to pour their crafts at Nevada’s largest beer festival, the Great Vegas Festival of Beer (GVFB) taking place Downtown. 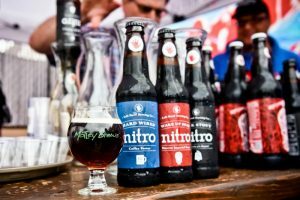 The Grand Tasting, serving more than 500 different brews, will be held outside from 3 to 7 p.m. on Saturday, April 8. Tickets are $40 for general admission and $55 for early entry. For the first time the GVFB is spanning two days by introducing the Mad Craft Experience on Friday, April 7 from 7-10 p.m. Mad Craft will be judged like a science fair for beer, encouraging playful combinations. A panel of local industry judges will present awards in four beer and four culinary categories. Tickets start at $75. Beer Park at Paris will acknowledge National Beer Day on Friday, April 7 by offering day-fresh Budweiser sent directly from Budweiser’s brewery in Fairfield, Calif. The rooftop bar and grill always offers more than 100 beer selections, including 36 drafts on tap, and many beer-infused dishes.SLS Las Vegas® is cheering on National Beer Day with a month-long “Tap Takeover” at Umami Burger, Beer Garden and Sports Book, featuring drafts by Lost Coast Brewery exclusively for the month of April. The Northern Californian microbrewery will feature popular brews on five Umami Burger’s taps, including: Great White, Sharkinator White IPA, Tangerine Wheat, Downtown Brown, and Alleycat Amber. 27TH ANNUAL AIDS WALK LAS VEGAS SET AT TOWN SQUARE: Aid for AIDS of Nevada’s (AFAN) 27th annual AIDS Walk Las Vegas, the organization’s largest fundraiser, will take place Sunday, April 23 at Town Square. Penn & Teller will serve as grand marshals for the 16th consecutive year. They encourage walkers to take the Penn & Teller Challenge, matching every challenger’s $250+ donation dollar for dollar. Last year’s walk with more than 5,000 walkers raised $350,000.There will be performances by the Chippendales, RuPaul’s Drag Race’s Coco Montrese, Absinthe’s Green Fairy Melody Sweets, nonprofit arts group Broadway in the Hood, the Las Vegas Pride Spinners, Tape Face from “America’s Got Talent,” and original musical “Clown Town” written by Michael Brennan. Event will also have more than 25 different vendor booths, a carnival game area, and brunch at Lazy Dog Restaurant & Bar for participants. The family and pet friendly event requires a $10 donation or fundraising goal to participate in the walk. GARY CLARK JR. RETURNS TO BROOKLYN BOWL: Austin-born blues rock prodigy Gary Clark Jr., who has shared the stage with Eric Clapton, B. B. King and The Rolling Stones among others, is returning to Brooklyn Bowl at The Linq Promenade Tuesday, June 20 at 8:30 p.m. Clark’s most recent album, “Live / North America 2016,” was released last month on March 17. Tickets start at $35. COUNTRY STAR DAVID NAIL WILL PERFORM AT BOULDER STATION: David Nail is returning to Las Vegas for a special performance at The Railhead inside Boulder Station Friday, April 28 at 8 p.m. During the making of his fourth MCA Nashville album, “Fighter,” released last year, Nail underwent a transformation personally and musically following the birth of the singer-songwriter’s twins. Nail’s biggest hit to date is his platinum-certified “Whatever She’s Got.” Tickets start at $22.50. URBAN TURBAN STARTS COOKING CLASSES: Urban Turban at 3900 Paradise Road is launching a cooking class series on Friday, April 7 from 5:30-7:30 p.m. and continuing every two weeks thereafter. Sessions will cover the techniques and flavors of popular Indian dishes from Master Chef Tarun Kapoor, with demonstrations on an appetizer, entree and dessert for $40 per person. 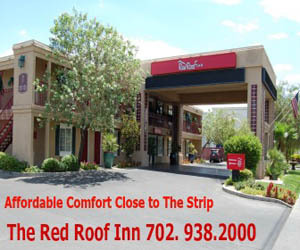 Class sizes are limited; call 702-826-3217. Since graduating from India’s prestigious Institute of Hotel Management Pusa, award-winning Chef Kapoor has spent the last 15 years mastering modern Indian culinary art, specializing in gastronomy style. He has held positions at five-star hotels, cruise lines and flight kitchens. WYNN OFFERS MASTER CLASS SERIES: Image coming to Las Vegas to actually learn something from the pros. Thanks to Wynn Las Vegas a wealth of knowledge presented in a series of workshops led by master chefs, sommeliers, mixologists and artisans awaits. Three classes are $125 and two are $150. To register, call 702-770-7070. The series begins Thursday, April 6 at 11:30 a.m. in Sinatra at Encore with Pasta, Frank’s Way led by restaurant’s Executive Chef Theo Schoenegger and the performer’s granddaughter AJ Lambert. The interactive workshop is crafting handmade pasta and simple preparation techniques. The session includes a three-course lunch, recipe cards, a keepsake gift and a certificate of completion. The second class at Lakeside at Wynn is Vintner For A Day: Blend Your Own Wine on Friday, April 21 at 3 p.m. with Wynn’s executive director of wine, Mark Thomas, and Master Sommelier Joseph Spellman of Justin Vineyards for an exclusive interactive winemaking workshop. On Thursday, May 4 at 7 p.m. at Intrigue nightclub, Wynn Nightlife’s DJ Clutch will share his secrets for creating the perfect club vibe with Spin With A Star DJ. An exclusive beauty workshop will get you camera ready for Mastering Your Most Flattering Selfie on Friday, May 12 at 3 p.m. at the Claude Baruk Salon at Encore. You’ll sip champagne while learning pro make-up and hair tips, and styling secrets of Hollywood photo shoots. On Friday, June 9, you can learn behind-the-bar secrets from Wynn’s resort mixologist, Damian Cross. This interactive workshop in Andrea’s at Encore at 2 p.m. also covers home bar essentials necessary for the up-and-coming mixologist. PET FRIENDLY EVENTS: Wolfgang Puck Bar & Grill at Downtown Summerlin will hold a special “Yappy” Hour, Saturday, April 8 from 3-5 p.m. The Summerlin neighborhood restaurant will showcase cocktails, dog treats and an array of small bites for patio-goers with 10 percent of the proceeds garnered during the happy hour event going to The Animal Foundation. The first 50 attendees with their furry friends will receive exclusive gift bag compliments of Wolfgang Puck and area pet shops. 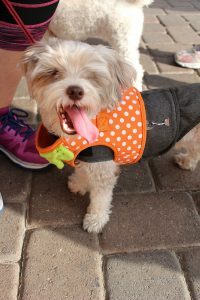 Life Time Athletic Green Valley in Henderson will hold its spring complimentary fun Puppy Power 5K at 9 a.m. Saturday, April 8. Participants can bring their furry friends. To RSVP, call 702-802-7300. Nightclub & bar convention will return: The Nightclub & Bar Convention and Trade Show ended last week and will return to the Las Vegas Convention Center March 26–28, 2018. Nightlife mogul Neil Moffitt, CEO, Hakkasan Group was a keynote speaker. His empire, which started in Las Vegas with the opening of dance club Hakkasan in April 2013, now has 70,000 employees and 60 venues around the world with another 30 coming online in the next three years. Meanwhile, sbe Founder and CEO, Sam Nazarian has verified that his leading lifestyle hospitality company is in advance negotiations to merge with Hakkasan Group. 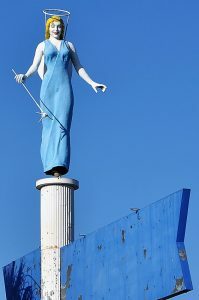 NEWS CLIPS: The 16-foot Blue Angel statue with the halo was taken down last week at 2110 Fremont Street after standing over the motel for 61 years. The City of Las Vegas with money from the Centennial license plates will have the statue refurbished so it can rise again when it is re-installed on the median near Fremont Street and Charleston Boulevard within the next six months. 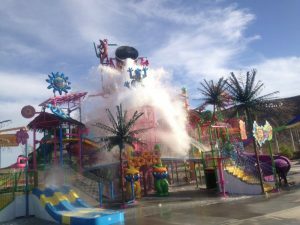 The Clark County Fair & Rodeo will be held April 12-16 in Logandale near Las Vegas. The annual regional festival is down-home American fun with a rodeo, a variety of country and rock concerts, dance performances, carnival rides, exhibits featuring fine arts, horticulture, a livestock show, and more. The outdoor Spring Wine Walk will take over Red Rock Resort’s restaurant patios from 5-8 p.m. on Saturday, April 15. Admission is $50 and $60 for VIP. Now open at Caesars Palace, Stripside Café & Bar with Strip views has a combo meal deal with an entrée, side and beverage at any time for $19.66, honoring the resort’s opening in 1966. In addition, Stripside Café & Bar has a Grab & Go counter. 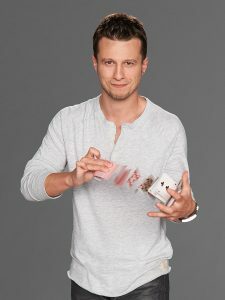 In recognition of Month of the Military Child, magician Mat Franco is inviting military service members and their families to his show, “Mat Franco – Magic Reinvented Nightly” at The Linq with a special $35 discount (code 35MIL) off select seats throughout April. You can get in the Easter spirit with “Sister’s Easter Catechism: Will My Bunny Go To Heaven?” show in the Troesh Studio Theater at The Smith Center April 6-9. This one-woman show has the Sister answering time-worn season questions like “Why isn’t Easter the same day every year like Christmas?” Part pageant, and wHOLY funny, this show unearths the origins of Easter bunnies, eggs, bonnets, baskets, and Peeps. Classroom participation is a must. Tickets are $35 – $40. A panel discussion, Courtroom Conversation: The Media and the Mob in Las Vegas, with veteran journalists and local attorneys from the era will be held at the Mob Museum Tuesday, April 4 at 7 p.m. Wet’n’Wild near I-215 and Sunset Road is open again from April 1 through Sunday, Oct. 1 and throwing a week-long spring break bash with Cierra Ramirez and a “Be Kind” pledge day, April 8-16. “Sunny The Bunny” will host an Easter meet-and-greet on Saturday and Sunday, April 15 and 16 from 11:30 a.m. and 2 p.m. Camp Rhino will also hold a Ninja Warrior Course Competition on Saturday, April 15. For a limited time, guests purchasing two Season Passes will receive one Season Pass for free. It will be movie night at the National Atomic Testing Museum on Friday, April 7 from 6-8:30 p.m. The film will be Sidney Lumen’s 1964 Cold War classic film “Fail Safe” with Henry Fonda and Walter Matthau. Admission is free. Essence Vegas marijuana dispensary and resource center celebrated its first anniversary in Las Vegas by giving a check of more than $14,500 for the Veterans Village Las Vegas, a transitional and permanent housing residence dedicated to veterans in need. Donations were collected in the three Essence Vegas locations throughout the last 12 months. NEON MUSEUM UPDATE: The Neon Museum just updated its pricing schedule and night tours are $26 for regular admission. The Neon Museum/The Mob Museum ticket combination is now $32 for daytime and $39 for nighttime – online sales and in lobby purchase only. Last week in preparation for its expansion, the Neon Museum demolished the L.A. Street Market building, which was adjacent to the La Concha visitor’s center and museum store. The expanded space will house 30 more signs, which have been in storage, including those from the Las Vegas Club, Spearmint Rhino, Longhorn Casino, Sahara Saloon, Opera House Saloon and Riviera. Once construction on the 0.27-acre parcel is completed later this year, the new outdoor exhibit area and events center will host a variety of private events and public programs.